Fundraising events | Alzheimer Society of B.C. 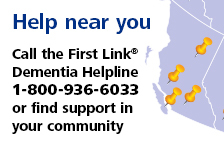 The Alzheimer Society of B.C. hosts a number of signature events throughout the year. The dollars raised at the events support the 70,000 British Columbians and their families who are affected by the disease. Your participation in our events makes a significant difference for those living with the disease through Alzheimer programs and services in your local community. We make it easy for you to plan an event or turn an existing event or challenge into a fundraiser in support of the Alzheimer Society of B.C. To learn more, please visit Anything for Alzheimer's. Local keynote speakers offer industry-related observations and expertise as well as personal insights on the challenges of supporting those impacted by dementia. These two events occur in February and March and create awareness of Alzheimer’s disease and other dementias, and raise funds for the many programs and services offered by the Alzheimer Society of B.C.Don’t miss the opportunity to connect with a wide range of corporate and community professionals at Breakfast to Remember. With the IG Wealth Management Walk for Alzheimer's, you help transform the way we all live with and challenge dementia. Join us on the first Sunday in May in your community. While our Walk has a new date and a new name, it is the same great walk in support of the Alzheimer Society of B.C. The Investors Group Walk for Alzheimer’s expressly names the disease for which funds are being raised. We're saying the name of the disease publicly to fight stigma. By walking with other provinces on the same date, we are united for a world without Alzheimer’s. The Forget Me Not Golf Tournament is the Alzheimer Society of B.C. 's largest annual research fundraiser. Proceeds are divided equally between supporting families in B.C. who are living with the disease and funding research for the causes and the cure through the Alzheimer Society Research Program. With your help, there is hope we’ll find the cause and cure. The event is held each year in May. Run or walk for the sake of others! The Alzheimer Society of B.C. is one of the chosen charities benefiting from the Scotiabank Vancouver Half-Marathon & 5K every June. The event’s Charity Challenge gives our supporters the opportunity to raise dollars for Alzheimer’s disease and related dementias. Make your Coffee Count at the Alzheimer Society of B.C.’s Coffee Break®. Held on the third Thursday of September, this national fundraiser joins communities across the country. While sharing a cup of coffee, families, friends and co-workers gather together throughout B.C. to raise awareness and funds for Alzheimer's disease and other dementias. Participants in the Climb for Alzheimer's take part in a journey on Grouse Mountain that mirrors the uphill challenge faced by people with dementia. Help them up that mountain. With 2015, we introduced the Summit Stroll, an opportunity for supporters to take part without having to do the Grind. For 2018, the event will be held on September 30. Partnerships with local and provincial corporations, public and private foundations, service clubs and health authorities allow the Alzheimer Society of B.C. to continue helping anyone concerned with or facing dementia. Our programs and services give people the confidence and skills to maintain their quality of life as we continue to research the causes and a cure for the disease. For more information, or to enquire about sponsorship opportunities, please contact us at events@alzheimerbc.org or by calling us at 1-800-667-3742.